2011 has been an exciting and action packed year for Raptivity. We had promised ourselves that Raptivity would showcase much more innovative means to creation of interactivities. It was very exciting to watch this happen as the year passed by. All the new releases, conferences, award shows, webinars and press releases shaped out amazingly well and brought out Raptivity as an easy to use, intelligent interactive building tool. With the Year End at the corner, it is that time of the year where people take a short break and reflect back on what one has achieved in the whole year and plan for the next year with much more energy. Here is a quick wrap-up of the events that kept Raptivity buzzing throughout the year. Celebrates Fifth Anniversary: In 2006, Harbinger Knowledge Products launched a cutting-edge eLearning software product designed to help instructors engage students with creative interactions named ‘Raptivity’. Since then, Raptivity has grown into one of the world’s top educational and training platforms with customers in 57 countries around the globe. This year, Raptivity completed five long exciting years which has changed the face of eLearning. We have been receiving quite a few inputs and suggestions from Raptivity users on features that they would like to have in the product. All these suggestions is what helped us shape a new Raptivity this year. Raptivity v6.5: This was released in August which included the five most popular packs (Essential, Active Learning Pack, 3D Turbopack, MindPlay Turbopack and Video Turbopack) of Raptivity, with various features our customers and partners had demanded such as video support, hyper link support, flexi controls, flexibility in terms of more options to add for instance; number of flash cards, pages in a book, etc. With Raptivity v6.5, people could now create interactivities in Right to Left languages such as Arabic. With the release we received a tremendous response to the new features which geared us towards our next release with more packs having similar features. Raptivity v6.6: Released in October which included all the features of v6.5 in the remaining packs except for Standard Packs. Additionally, with the increasing demand in mobile learning, ‘HTML5’ become the buzzword and people demanded more interactions with this support. Hence, we released “HTML5 Starter Pack” with 11 interactions having HTML5 publishing capabilities. With this release, Raptivity became the single provider of highest number of HTML5 interactions in the eLearning market. Raptivity v6.9: With the release of Raptivity v6.9, all packs of Raptivity including Standard Packs now included the much demanded features. Many of the interactions in Standard Packs were consolidated to make it even more flexible and user friendly in creation and customization. For example, three cell crossword, four cell crossword and five cell crossword interactions are now merged into one interaction called “Crossword” interaction. With all these changes, Raptivity now provides 173 interactions as part of Himalaya pack. Identified as the Easiest to Use Tool: For a series of questions asked by The eLearning Guild Survey, Raptivity figures in the top seven tools used by various eLearning practitioners around the world. In the ‘ease of use’ category of questions, Raptivity leads the pack with over half the respondents claiming that the tool is ‘very easy’ to use. Click hereto download the report. Bagged Awards: Raptivity won a platinum award in ‘Best Learning Innovation Technology’ category and two Gold awards in ‘Best Simulation Solution’ and ‘Best Assessment Tool’ categories at the 2011 LearnX Awards. Raptivity was also amongst the Top Finalists for the Software Satisfaction Awards 2011. Time has flown by very fast and after this speedy ride through the year, we wish to thank each one of you for your support, feedback, collaboration and suggestions for Raptivity. Looking forward to your suggestions in the coming year so that Raptivity scales greater heights in the interaction domain. Feel free to share your inputs on the new version and suggestions at info@raptivity.com or write it as a comment to the post below. 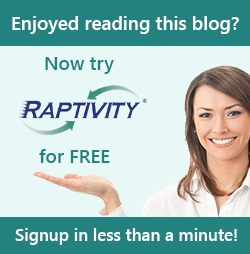 Happy New Year to all the readers and Raptivity users!